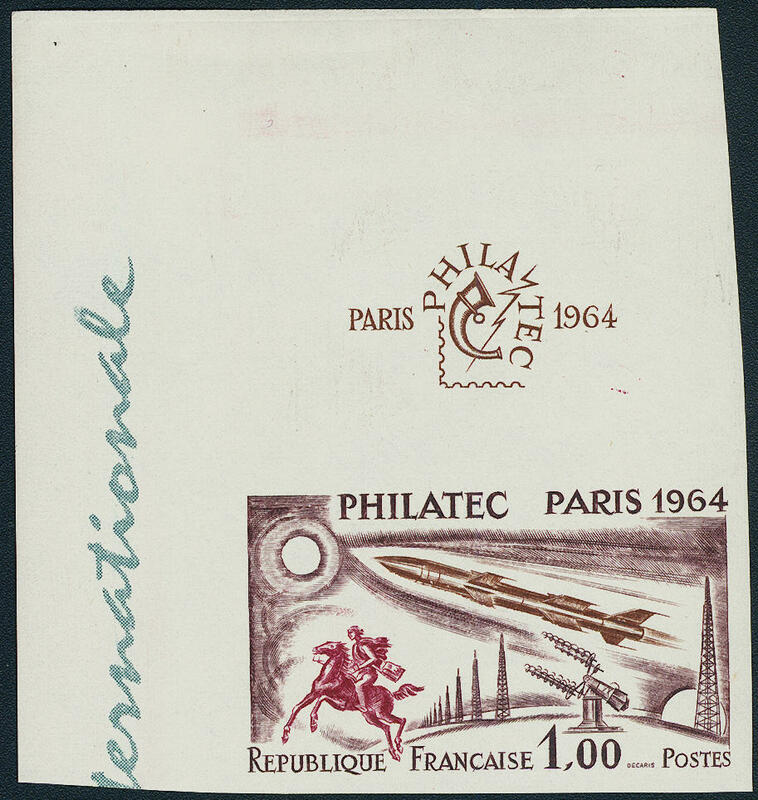 3766 Fheetlet 1104 15 Fr. 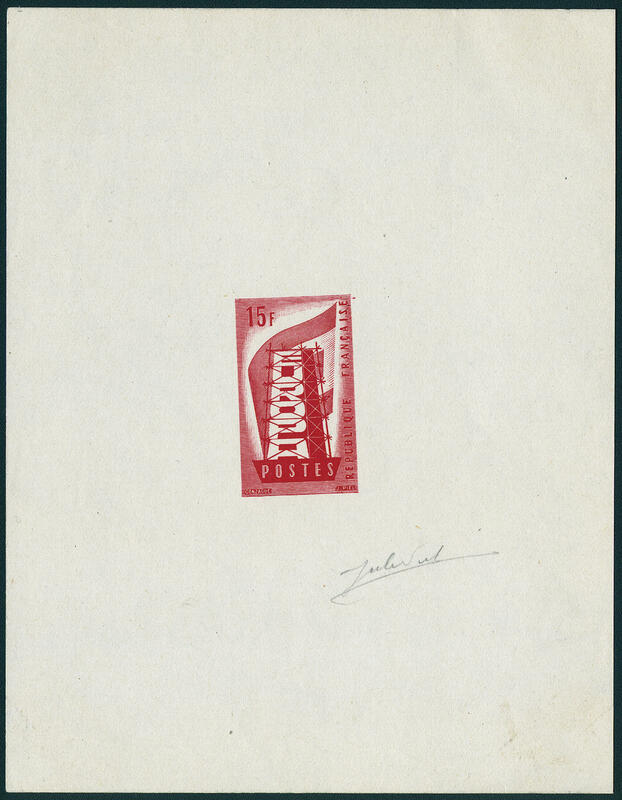 Europe 1956, rare Artist block in red with signatur \"JULES Sounded\", reverse small Rust trace. Very rare! 3767 1104/05 Europe 1956, both values as Secretary of State souvenir sheet, in perfect condition, very small edition, Maury 750,- €. 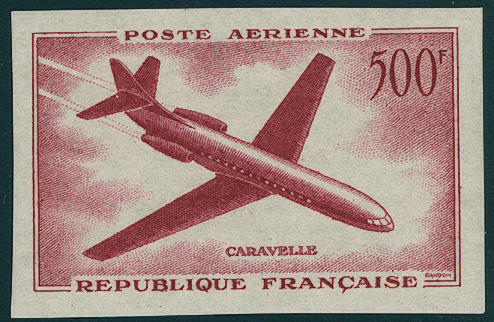 3768 1104Probe 50 Fr. 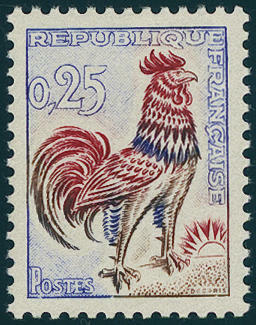 Europe 1956, artist proof (Epreuve D´Artiste), folded, size 140:95 mm, very rare, expertized Calves. 3769 Fheetlet 1120 500 Fr. 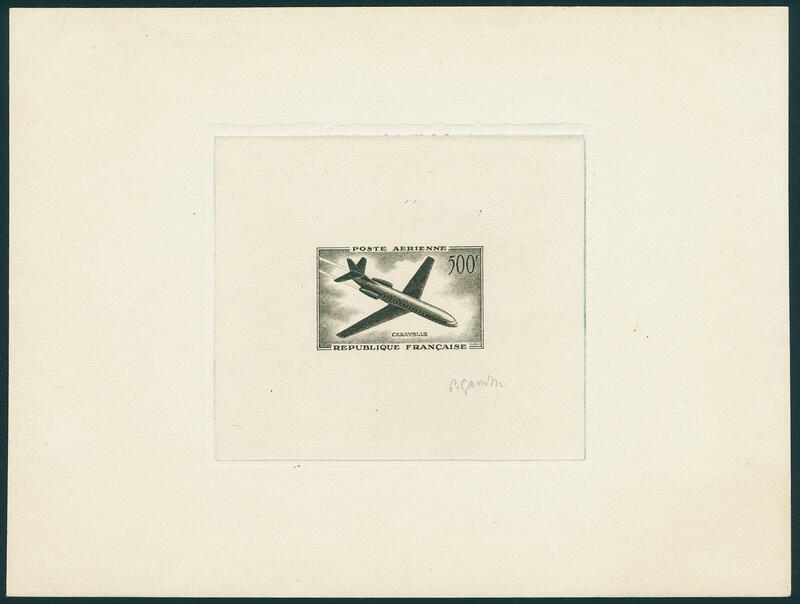 Pelt airliner Caravelle 1957, very rare Artist block in black with signatur of the designer \"GANDON\". Very small edition! 3770 1120PU 500 Fr. 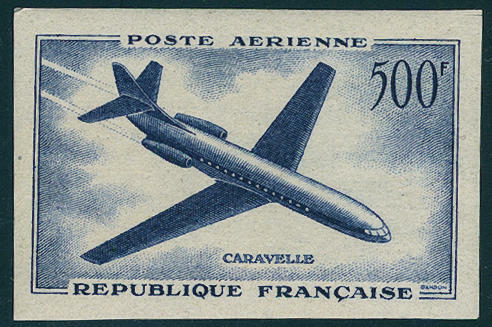 Caravelle 1957, five trial proofs in different colours, unperforated, in perfect condition mint never hinged a scarce set! 3771 1157/58U Europe 1957, unperforated block of four set from upper margin, large margins all around and in perfect condition mint never hinged, rare, Maury 1200,- €. 3772 1262PU 25 Fr. 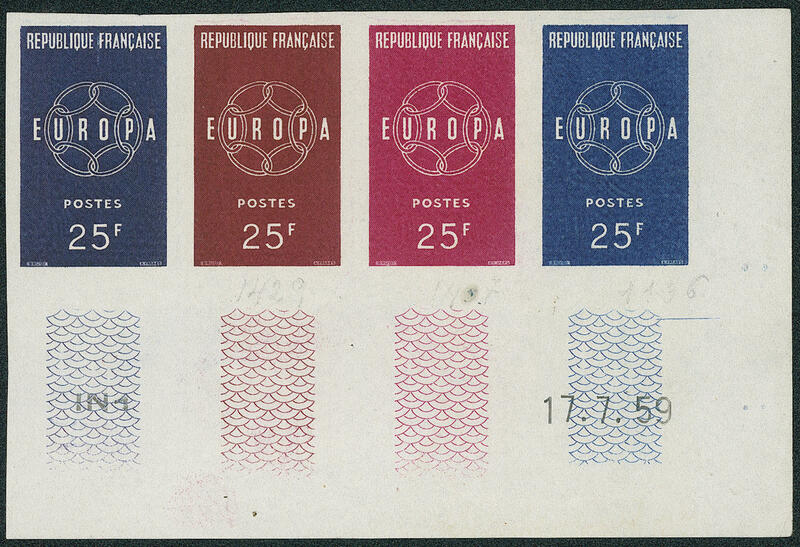 Europe 1959, unperforated proof strip of four from of the right lower corner of the sheet with date of printing \"17.7.59\" in four different colours, in perfect condition mint never hinged rare! 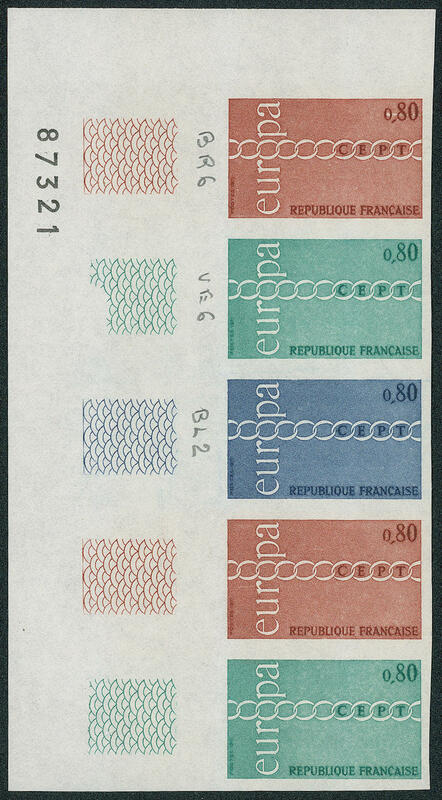 3775 1749PU 80 C. Europe 1971, unperforated proof strip of five in three different colours from the corner of the sheet with sheet number, in perfect condition mint never hinged rare! 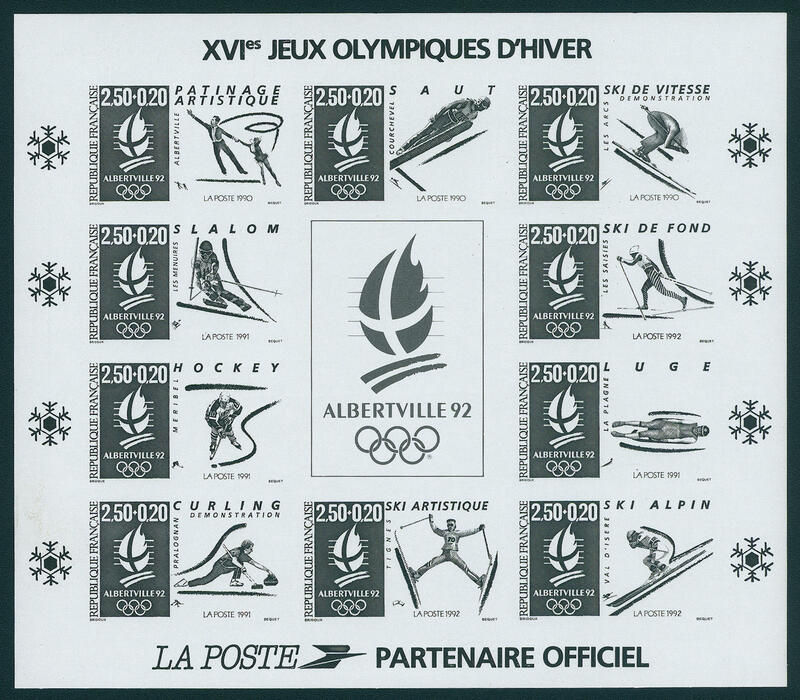 3776 Bl.12SD Olympic winter games souvenir sheet Albertville 1992, unperforated special print in black, in perfect condition mint never hinged very small edition! Ceres 625,- €. 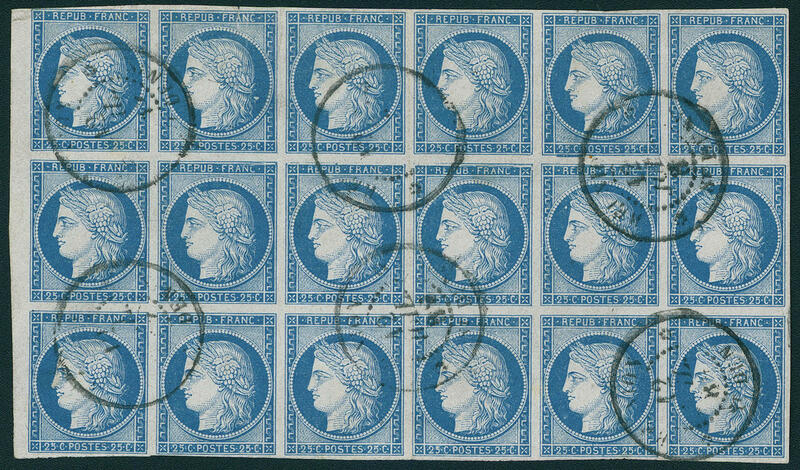 3813 ⊙ 19 25 C. Blue, Ceres, wonderful unit from 18 values, fresh colors from left margin of sheet, on all sides having full to wide margins, a value above minimum tear, neat cancelled a very decorative and scarce unit! Expertized Roumet. 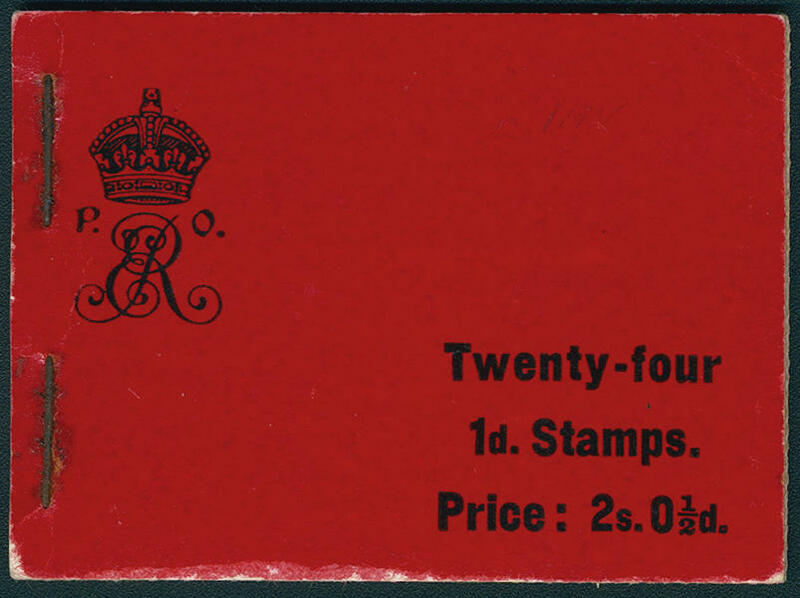 3827 SG BAI King Edward VII, complete stamp booklet with red booklet cover, original clasped, booklet cover with minimal faults, in perfect condition mint never hinged with all four stamp booklet panes, these with inverted watermark. Rare! 3814 92 5 Pfd. 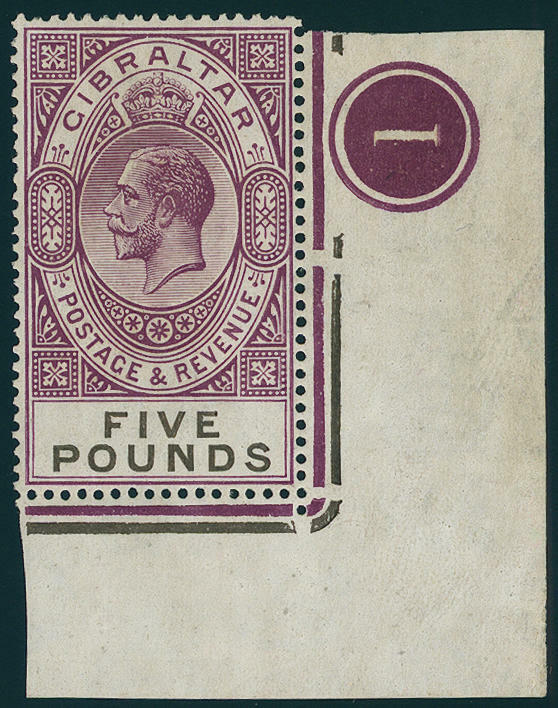 King George V. 1925, wonderful fresh colors from of the right lower corner of the sheet with plate number \"1\", normal perforated, in perfect condition mint never hinged, hinge trace only in the margin of sheet. 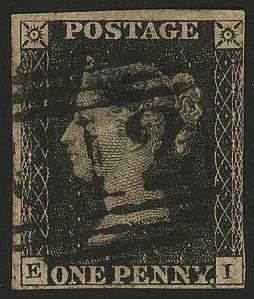 Already normal mint never hinged examples of this issue are rarities. In this kind with plate number a significant rarity from Gibraltar! Signed Ebel and expertized Walter angel. 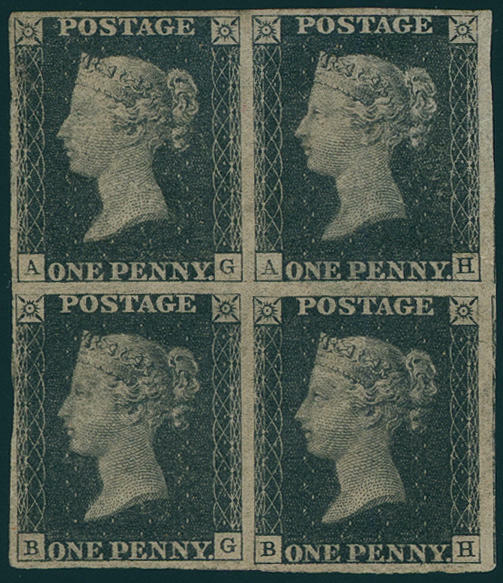 3818 1 One penny black, plate V, wonderful block of four, on all sides perfect margins, right with parts of the neighbour, unused with slightly toned original gum, left lower stamp with tiny thin place and minimum gum crease, virtually meaningless, wonderful fresh colors. 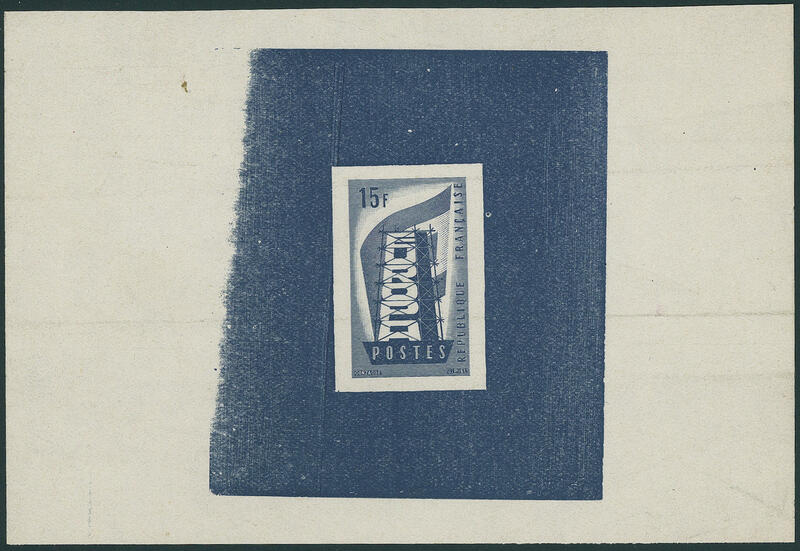 Already unused single pieces of the world's first stamp are very rare. Blocks of four are among the great rarities of Europe, and this is a particularly attractive specimen. This top piece already adorned the collections of Ernest Dale, fisher and Sayeed. Photo certificates Royal Philatelic Society / London from 1944 and PTS from 2012. 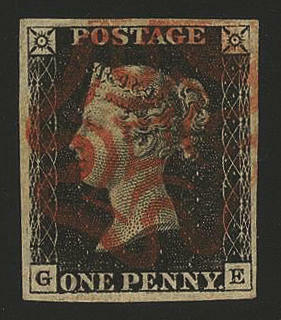 Stanley gibbons 140000,- British pound. 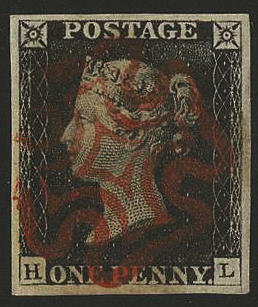 3819 ⊙ 1 1 P. Black, fresh colors and three sided good margins, right touched, with scarce centered number postmark \"12\", thin, left above corner crease, a sought cancellation, Stanley gibbons 1500,- pound. 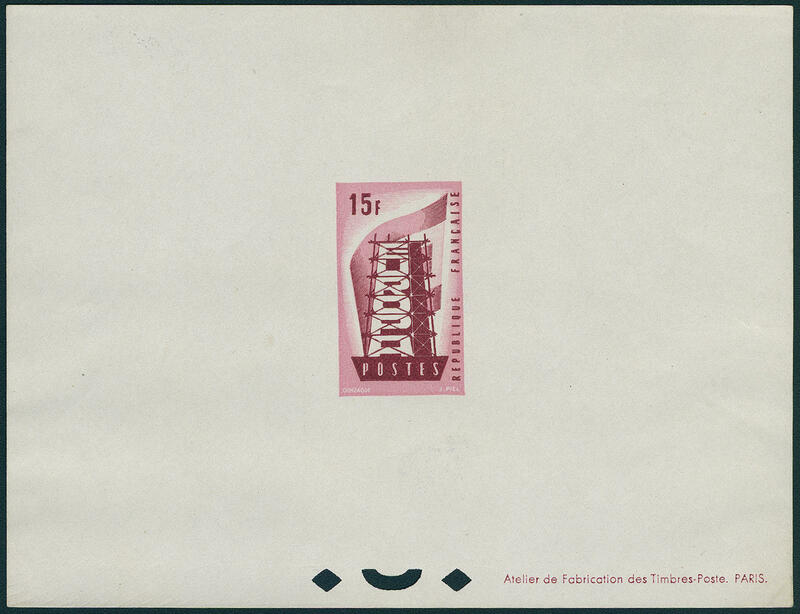 3820 ✉ 1 1 P. Black, corner letters \"T-E\", wonderful having bright colors and on all sides piece in outstanding quality with enormous margins on very nice cover with red Maltese Cross and turning into red town cancel \"CHELTENHAM 6. OCT 1840. 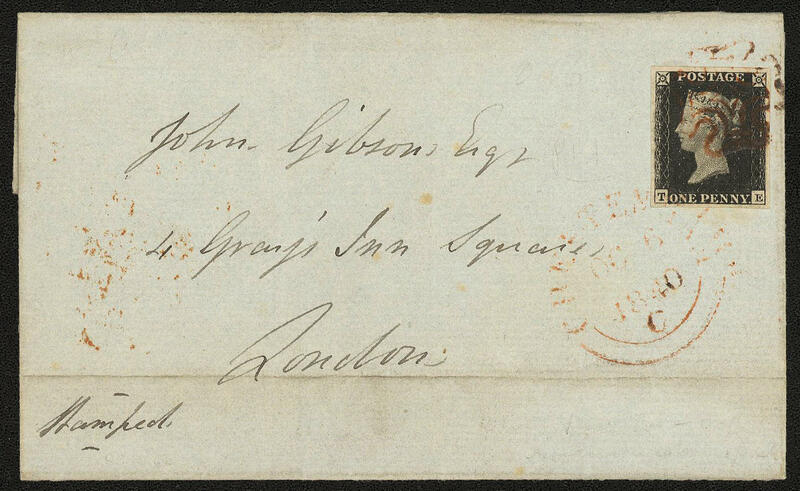 \" to London with arrival postmark. 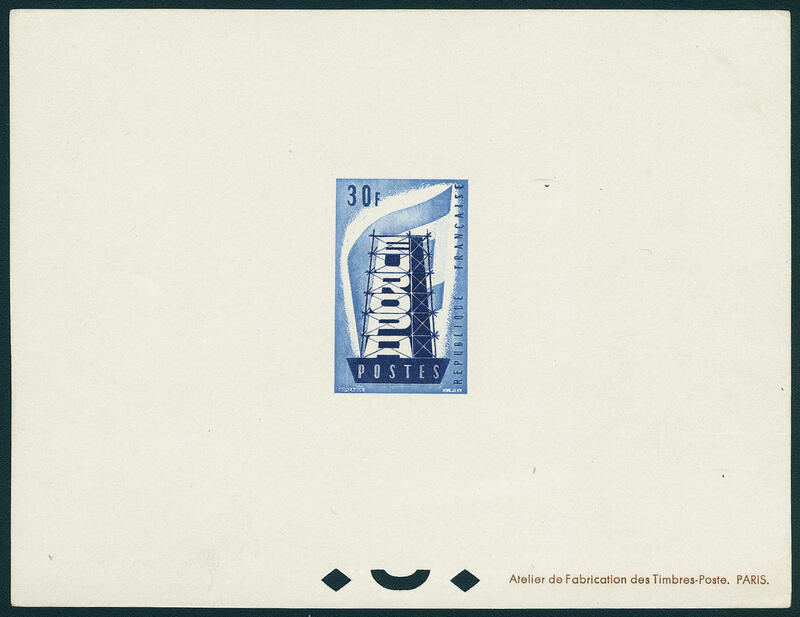 A very nice cover of the first stamp of the world! 3821 ⊙ 1Pl.1A 1 P. Black, wonderful having bright colors and on all sides piece in outstanding quality with enormous margins with centric mounted red Maltese Cross, plate 1 A. An exception copy! 3822 ⊙ 1Pl.4 1 P. Black, plate 4, wonderful having bright colors and on all sides piece in outstanding quality with enormous margins with centered red Maltese Cross. Connoisseurs piece! 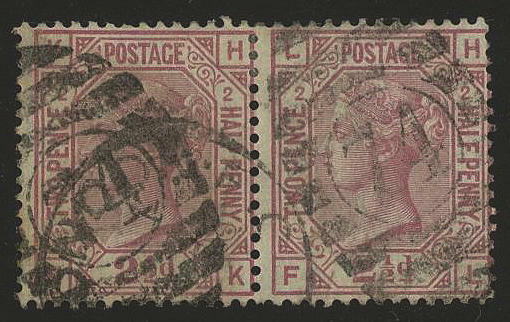 3823 ⊙ 40Pl.2xF 2 ½ P. Lilac-rose with rare variety \"corner letters LH / FL in lieu of LH / HL\" in the pair with normal stamp se-tenant, in perfect condition with number postmark \"74\" and additional single circle postmark. Extraordinarily rare! Michel 1850,- €.